Stephen Wilbers teaches the essentials of effective writing and speaking. Something happens to students in the Management of Technology (MS-MOT) graduate program during the time that they spend in Communication in a Technical Environment, a course taught by Stephen Wilbers. In fact, they invented a word to describe the experience. "Being ‘Wilberized’ means that you will copy edit everything you write and everything you read for the rest of your life," says Amy Falls, department manager of information systems at General Mills and a 2005 MOT student. The experience continues to reap benefits. "People are evaluated on their ability to effectively communicate their thoughts and ideas," says Falls. "I am more valuable to my organization as a result of what I learned." 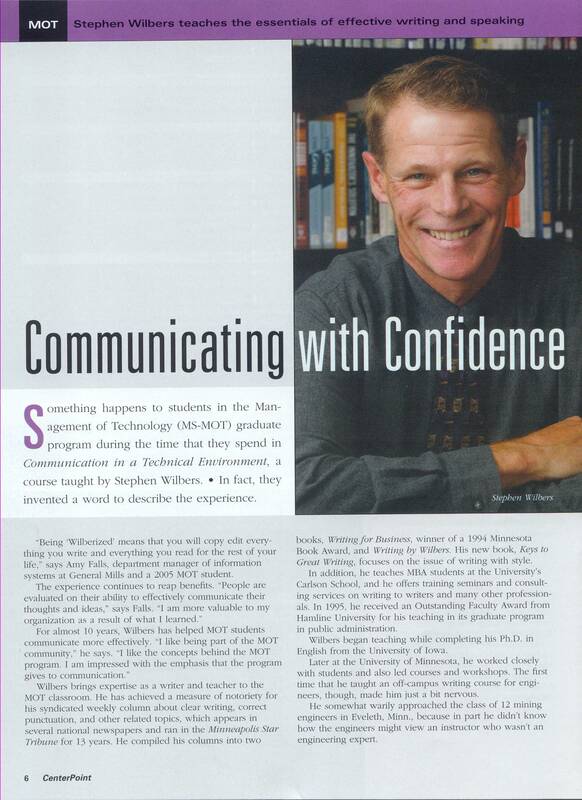 For almost 10 years [now 20 years], Wilbers has helped MOT students communicate more effectively. "I like being part of the MOT community," he says. "I like the concepts behind the MOT program. I am impressed with the emphasis that the program gives to communication." Wilbers brings expertise as a writer and teacher to the MOT classroom. He has achieved a measure of notoriety for his syndicated weekly column about clear writing, correct punctuation, and other related topics, which appears in several national newspapers and [has been running] in the Minneapolis Star Tribune for 13 years. He compiled his columns into two books, Writing for Business, winner of a 1994 Minnesota Book Award, and Writing by Wilbers. His new book, Keys to Great Writing, focuses on the issue of writing with style. In addition, he teaches MBA students at the University’s Carlson School, and he offers training seminars and consulting services on writing to writers and many other professionals. In 1995, he received an Outstanding Faculty Award from Hamline University for his teaching in its graduate program in public administration. Wilbers began teaching while completing his Ph.D. in English from the University of Iowa. Later at the University of Minnesota, he worked closely with students and also led courses and workshops. The first time that he taught an off-campus writing course for engineers, though, made him just a bit nervous. He somewhat warily approached the class of 12 mining engineers in Eveleth, Minn., because in part he didn’t know how the engineers might view an instructor who wasn’t an engineering expert. "They were as hesitant of me as I was of them," says Wilbers. He soon learned his worry was for naught: The mining engineers wanted to improve their writing ability, and the course focused on bolstering those skills. "By the end of the day, we realized that we had plenty to share with each other." He continues to enjoy his now long-standing classroom collaborations with engineers and scientists. Wilbers often finds his MOT students eager to apply the principles of good writing and presenting in their work, even if they may be somewhat anxious at first. "My message to technical writers is to think about the traits that make a technical person do well, such as focus and attention to detail,’ he says. "Those same qualities are important to becoming a good writer." In the MOT program, Wilbers devotes four class sessions to writing and four class sessions to speaking. He introduces the concepts and then puts students to work on exercises. Wilbers knows that practice helps students hone their skills and increase confidence in their ability to communicate well. The writing portion of the course covers the basics of grammar and punctuation and the importance of clarity, organization, and style. It also explores word choice, editing, and proofreading. "I want to take the mystery out of writing," he says. Throughout the years, Wilbers has collected a wealth of resources and materials. He shares those materials with his class, including a list of the 75 most common errors. By increasing their awareness about errors, students can avoid making the same mistake twice, he says. "Steve doesn’t just present," says Gaston Ray, software configuration manager for General Dynamics Advanced Information Systems Inc. and a 2005 MOT student. "He has real-life experience, and he brings those life experiences to the class. Each presentation is built with the main objective designed to encourage each student to achieve a high standard in their speaking and writing skills." MOT students hone their presentation skills – and frequently overcome the fear that can accompany a presentation in the public speaking portion of the course. Wilbers has seen students progress significantly in writing and speaking. Their success fulfills his goal of helping students make transformations. "I want them to be more confident about their writing and speaking abilities," says Wilbers. "I want them to recognize the importance of writing in a professional position. I want them to know where they can find answers to their questions about writing. I want them to get into the habit of looking for the answers and not just guessing." The MOT program always has recognized the value and importance of communication, says Wilbers, and the emphasis on these skills only benefits MOT graduates. "This is a professional standard that they just need to have, and if they have it, it will help them advance and be more informed and successful." Falls and Ray agree on the importance of being "Wilberized." Falls used her skills when communicating with corporate leaders during a seminar. "I was able to confidently contribute and present in front of executive management," she says. "It was wonderful to see the benefits of an MOT course applied directly to a work situation."